Hudo, how were you able to reference "NETStandard.Library": "1.3.0" version 1.3, when there is only 1.6 available? This is exactly what I needed. I'm stunned that this scenario is not front and center in .net core docs... Both directions mentioned (Scott and yours) are key and it's just not as simple as it should be. Wasted hours down this path (like many others I suspect). Thanks for the article. We appreciate the effort! @nemke i just took lowest netstandard that supports .net 4.6, which is 1.3. But 1.6 is used, since that is supported by Core 1.0 - and 1.6 implements all 1.3 API surface. At least, that's my understanding! My understanding is that NETStandard.Library is different than netstandard API. 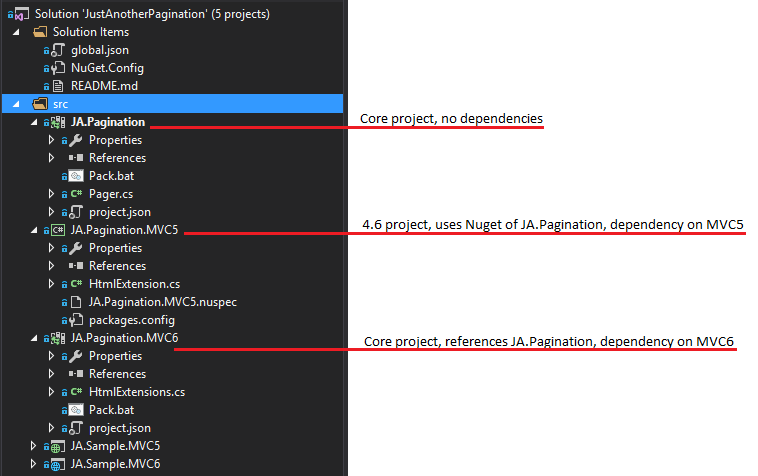 NETStandard.Library is metapackage on nuget that goes from 1.5 to 1.6 version. "Metapackages are a NuGet package convention for describing a set of packages that are meaningful together. They represent this set of packages by making them dependencies. They can optionally establish a framework for this set of packages by specifying a framework." For example netstandard1.3 just specifies target framework API to be used. So there is no NETStandard.Library version 1.3. It's only one metapackage, version 1.6, but you can target any netstandard1.x API with that metapackage. "It may seem strange to target netstandard1.3 but use the 1.5.0 version of NETStandard.Library. It is a valid use-case, since the metapackage maintains support for older netstandard versions. It could be the case you've standardized on the 1.5.0 version of the metapackage and use it for all your libraries, which target a variety of netstandard versions. With this approach, you only need to restore NETStandard.Library 1.5.0 and not earlier versions. The reverse would not be valid: targeting netstandard1.5 with the 1.3.0 version of NETStandard.Library. You cannot target a higher framework with a lower metapackage, since the lower version metapackage will not expose any assets for that higher framework. The [versioning scheme] for metapackages asserts that metapackages match the highest version of the framework they describe. By virtue of the versioning scheme, the first version of NETStandard.Library is v1.5.0 given that it contains netstandard1.5 assets. v1.3.0 is used in the example above, for symmetry with the example above, but does not actually exist."